Sounds like you have a good plant going. The ideal is to set a fruit on the main vine after 10 feet. 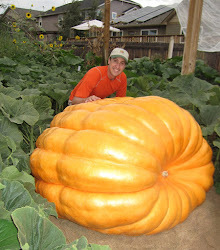 If you look at the statistics, the biggest pumpkins are grown on the main vine at about 12-14 feet. Having said that, I would pollinate any fruit starting at about 9 feet. You just never know when a female is going to show up on the main vine and if the fruit will set. You can start a couple on the main vine and go with the best one. "Best" is relative however. The first one set is always going to be bigger initially because it is older so compare the growth rate at the same number of days of growth and the position of the fruit on the vine and go with the best one. For the first 20 days the pumpkins put very little pressure on the plant, because they don't grow very fast. After about day 27 however they should start to take the plant over and vine growth will decrease rapidly. So for the first 20 days you can keep 2 or three pumpkins on the vine. Going back to at what length to keep the fruit, the most important piece is to have enough plant to power the fruit. Sometimes, some plants like to grow the main vine initially but it takes a bit for the side vines to come on. So you have a main vine that is growing super-fast and is 11 feet out but overall the plant does have a lot of leaves. So ideally you want a plant that has a Christmas tree shape when you pollinate so when that pumpkin starts pulling all of the plants energy there are enough leaves to power the pumpkin. So if you have a plant that is just a main vine with short side vines and you pollinate at 10 feet and then again at maybe 13 feet and both of the pumpkins seem to be growing relatively well and have good positions on the vine, go with the later fruit set. That will give the plant a little more time to fill out and be ready to power the pumpkin. It doesn't seem intuitive to take off the first fruit set with the bigger pumpkin early in the season, but when a pumpkin is putting on one or two pounds a day early it means nothing. All of the real growth starts happening around day 27 when ideally it is ramping up towards 40 pounds a day, so sacrificing a little early pays big dividends later.